1. He has not only helped a lot of people like me get into good colleges but has even managed to get them admitted with scholarships. He has a solid track record and people he has worked with will testify for that. 2. He didn’t push me to work with him rather he gave me the phone numbers of few of his ex-students and every student was very happy and gave a very genuine feedback. 3. The service he provides is value for money and comparatively very less to the other consultancy services. He very well knows which college is looking for which quality, transform your stories accordingly as per your profile and avoid anything which might make or break a college application. He gives honest feedbacks and will make you rework on essays time and again to get that perfect application ready for each school. The essay editing service he provides is just wonderful. You will literally be surprised on how he transforms your words into a story that creates an impact. You would think the product came right out of a fairy tale. 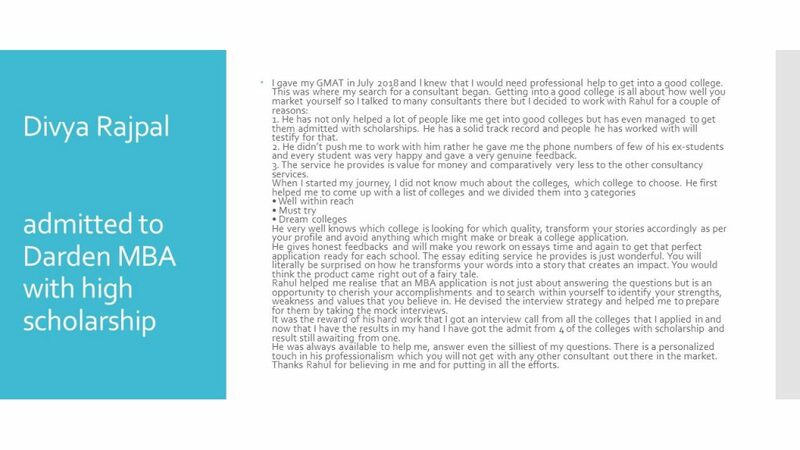 Rahul helped me realise that an MBA application is not just about answering the questions but is an opportunity to cherish your accomplishments and to search within yourself to identify your strengths, weakness and values that you believe in. He devised the interview strategy and helped me to prepare for them by taking the mock interviews. It was the reward of his hard work that I got an interview call from all the colleges that I applied in and now that I have the results in my hand I have got the admit from 4 of the colleges with scholarship and result still awaiting from one. He was always available to help me, answer even the silliest of my questions. There is a personalized touch in his professionalism which you will not get with any other consultant out there in the market. Thanks Rahul for believing in me and for putting in all the efforts.